Discussion in 'The Fedora Lounge Guides' started by Dinerman, Sep 10, 2012. 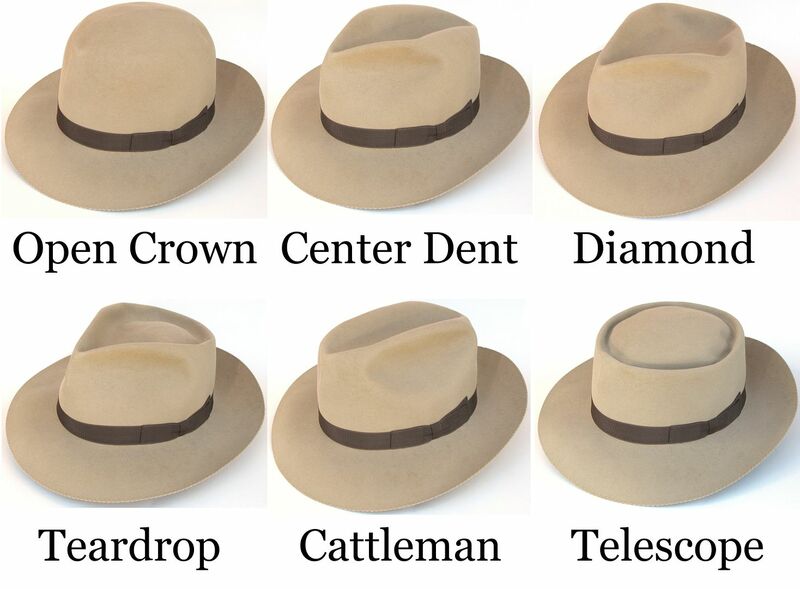 For those of you new to hats, here's a brief intro to terms and styles. For the sake of simplicity and easy reading, a lot of the finer points have been omitted, but this will at least get you started. This is in the guides section for reference, but to post in this thread, see the copy here. Fedora- Soft felt. Brim generally has some curl. Homburg - Soft Felt. Curled brim edge, nearly always with a bound edge. Typically will have a center dent crease, though other creases were also seen, especially in the 1930s and prior. Bowler - Stiff Felt. Curled brim edge, open crown. Generally will have heavily stiffened felt. Cowboy hat - Soft Felt. The defining characteristics of cowboy hats have changed dramatically. Generally characterized by wide brims and narrow ribbons. Porkpie - Soft Felt. Characterized by a telescope crease. 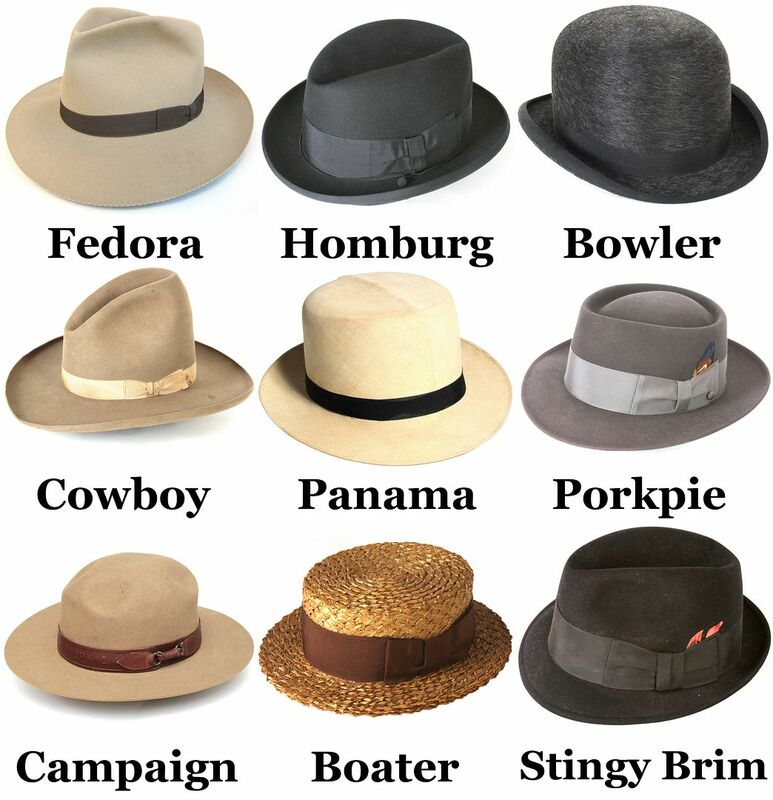 Brim may have typical fedora flanging, or may be flat. Particularly popular in the 1910s-1920s, and the 1950s-1960s. Campaign Hat - Generally heavily stiffened, especially the brim. A descendant of the "Boss of the Plains" style, the campaign hat is characterized by a short crown and flat brim. Associated with military usage, as well as with the park service. Boater - Straw. Stiff straw, produced in a variety of weaves/braids. Flat brim, flat topped crown, generally has wide ribbon. Stingy Brim (fedora) - Soft felt. A variant on the fedora style, popular in the late 1950s-1950s. Brim 2" and under. Generally accompanied with tapered blocking to the crown and a wide ribbon. Overwelt: Brim edge folded over and sewn. Related to the underwelt, where the brim edge is folded under and sewn. Cavanagh Edge: Brim edge is welted, but seamless. 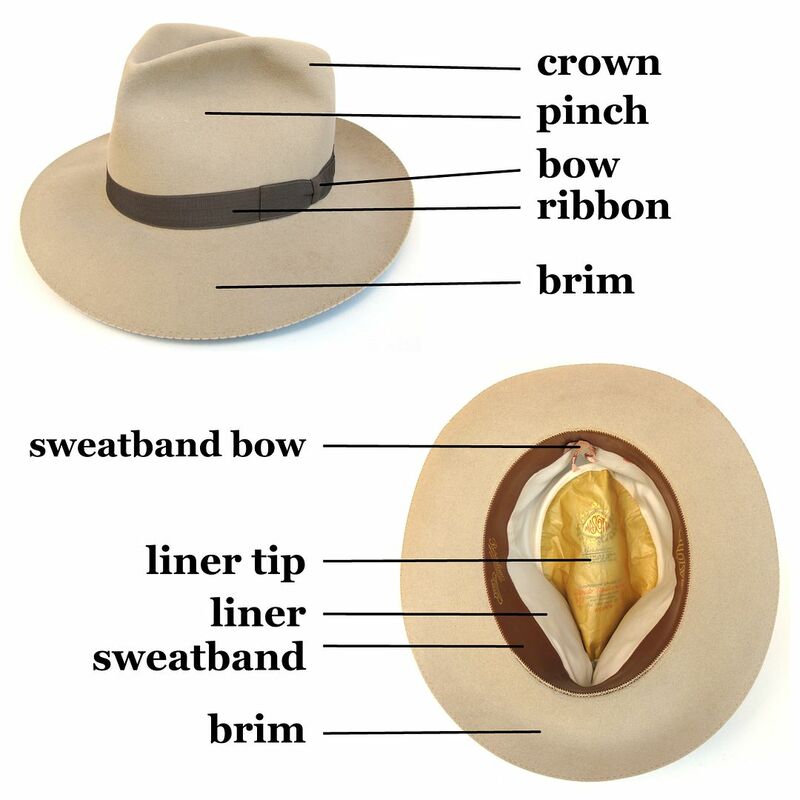 Unreeded: Leather of sweatband is stitched directly to the felt body of the hat, at the brim break. 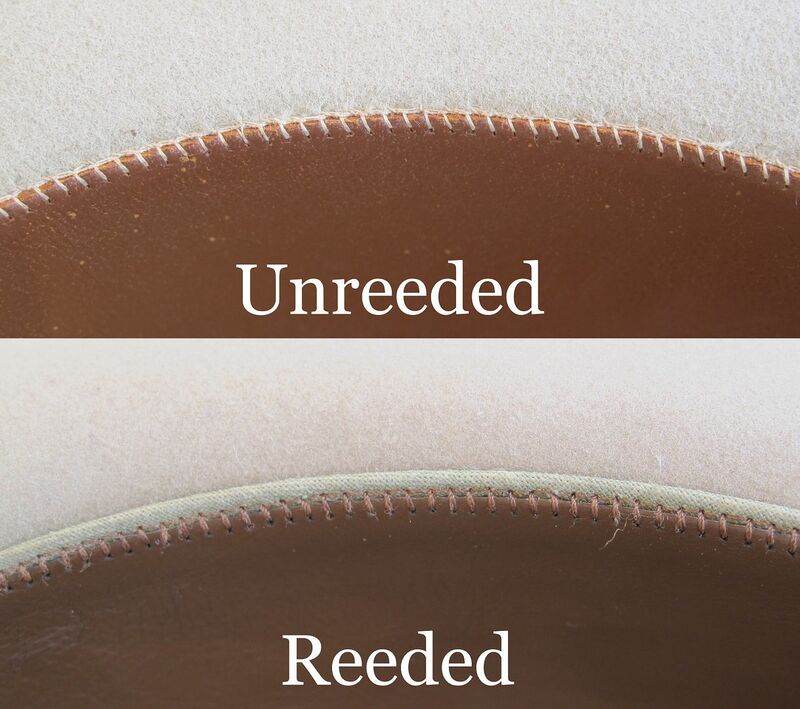 Reeded: Leather of sweatband is stitched to a secondary component (the reed tape), which contains a filament (the reed). 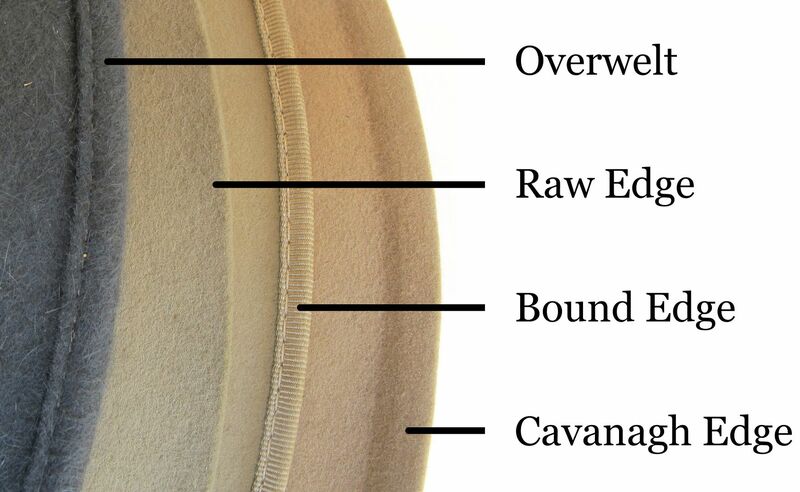 Reed tape is stitched to the felt body of the hat above the brim break. DRB, Brian Bloom, Antinomy and 5 others like this.